If Abraham Lincoln Had An iPod If Lincoln had used an iPod, it would have needed a lot of memory. Classical music commentator Miles Hoffman reports that the 16th president's musical tastes ranged from popular ballads to opera, and that his No. 1 favorite may have been, surprisingly enough, "Dixie." On Presidents' Day, we didn't want to neglect looking into our first president's musical preferences, so music commentator Miles Hoffman did some additional sleuthing. Hear Renee Montagne and Miles Hoffman discuss music in Washington's household. To celebrate Presidents' Day, we have conjured up Abraham Lincoln, but in a less-than-presidential pose: with earbuds dangling from his ears. Classical music commentator Miles Hoffman agreed to explore the 16th president's musical tastes, as well as what music Lincoln might have chosen for his iPod, had he owned one. The Lincoln iPod would have needed a lot of memory, as the president apparently enjoyed all sorts of music and loved opera. His love of opera apparently got him into trouble during the Civil War, when he was taken to task for attending a performance while the war was ongoing. To this, the president responded, "The truth is I must have a change of some sort, or die." "We know that Lincoln liked the opera Martha, by Friedrich von Flotow, and had it performed during the festivities for his second inaugural," Hoffman says. "Martha is not performed very often now, and it's mainly known for one very beautiful aria, 'Ach so fromm,' where the male romantic lead, Lionel, sings a love song to the title character, Martha. "We also know that one month before he died — on March 15, 1865 — Lincoln attended a performance of Mozart's Magic Flute at the National Theatre in Washington," Hoffman says. Another big favorite of Lincoln's was a kind of "crossover" artist, Louis Moreau Gottschalk. A Southerner by birth, born in New Orleans, Gottschalk was a one-of-a-kind composer, a virtuoso pianist and, perhaps surprisingly, a supporter of the Union cause. One of his most famous pieces is The Union (Fantasy on Patriotic Airs). When you listen to the beginning of the piece, it sounds like any flashy, 19th-century European virtuoso piano piece. But then Gottschalk launches into the tunes we all know, treating them in his own inimitable way. Lincoln was also partial to popular music and sentimental ballads, such as the songs of Stephen Foster. One of his favorites was an old Scottish love ballad called "Annie Laurie." Remarkably, No. 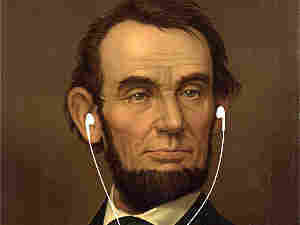 1 on Lincoln's iPod might have been his all-time favorite, "Dixie." "It had already been a popular song before the Civil War and came from a minstrel show," Hoffman says. "Lincoln had been quoted as saying, 'I have always thought "Dixie" one of the best tunes I have ever heard.' "
"After the war," Hoffman adds, "he is reported to have said, 'That tune is now federal property, and it is good to show the rebels that, with us in power, they will be free to hear it again.' "